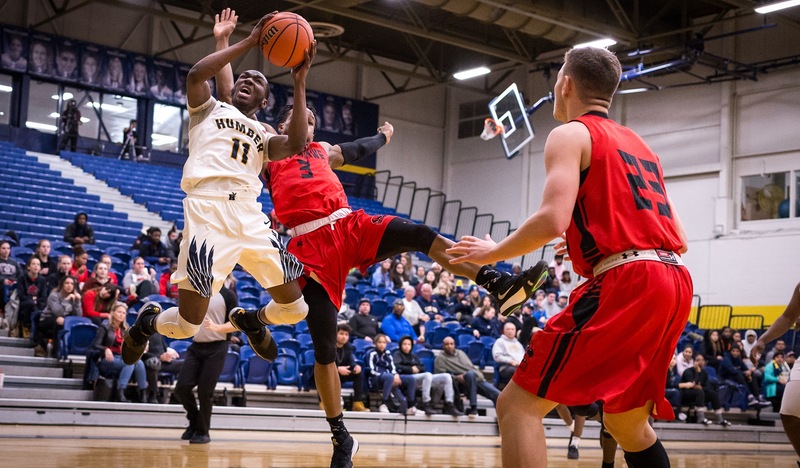 The Humber Hawks men’s basketball team were victorious on Sunday afternoon as they defeated the Fanshawe Falcons, 82-70. The Hawks are now 13-0 on the season, and the win gave head coach Samson Downey his 13th straight, the most ever by a Humber first-year coach. Curwin Elvis scored a career-high 26 points, as he went 11-13 from the free throw line. Kevin Otoo scored 17 points, grabbed seven rebounds and had three steals, Jaylan Morgan recorded a double-double as he scored 14 points and grabbed 10 rebounds. Fowzi Mohamoud’s struggles from the field continue, he scored seven points on 3-10 shooting. Chris Parker led Fanshawe scorers with 17 points, he also grabbed eight rebounds. D’Andre Austin recorded a double-double as he grabbed 13 boards to go along with 12 points. Moses Orozco-Rayo and Zach Soltis scored 15 and 11 points off the bench respectively. Humber had to do most of their work in the paint, as they only made three three-pointers from 24 attempts. They also went to the line 39 times, and made 31 which is a season-high. The Hawks struggled in the first half, but picked things up in the second half by scoring 52 points, which ultimately gave them the win. Humber’s next game is against Conestoga College at the North Campus gym. Tip-off is set for 8 p.m.